After a two week break, we started back at Zozo and got right into some heavy story stuff about Espers and the Esper world. We then headed to Jidoor and then did all the opera scene stuff. The opera is so complicated and full of so many differences that I’ve opted to give it its own dedicated page following this one. So this is Part 7 and the opera will be Part 7B or something. As a result, a lot of the screenshots on this page will all look very same-y and boring, but I promise that it’s worth reading through! My write-up below only covers some of the highlights from this section of the game. There are all kinds of other differences, big and small, that I bring up during the stream. So if you want to see even more translation comparison stuff, definitely check out today’s video. This big enemy is called “HadesGigas” in the Super NES translation, but it’s actually just called a “Hill Gigas” in Japanese. This strange name change makes me like 90% sure that the SNES translator accidentally thought it was supposed to be “Hell Gigas” and changed it to “Hades” to get around Nintendo’s content policies at the time. As we can see, the GBA and fan translations both get it correct. Also, this enemy has appeared in the first two Famicom Final Fantasy games, and its name is presumably a throwback to the “Hill Giant” from old Dungeons and Dragons stuff. A girl? Ain’t seen one. And there’s definitely not one on the top floor of this building. When we look at the Super NES translation though, we see that this line got mishandled. Instead of steering you away from the proper destination, now he literally sends you in that direction. But he’s supposed to be lying, so the Super NES translation accidentally turns this liar into a truth-teller. The GBA translation fixes this obvious mistake and adds a little bit of extra text telling you not to bother checking the top floor. The fan translation simply rephrases the faulty Super NES translation, but makes things worse by cutting out the second line of text. The heroes fight a boss named ダダルマー (dadarumā) in Zozo. I don’t think anyone has figured out if his name means anything, but the best guess I’ve seen is from Japanese fan sites suggesting it’s something related to the phrase 筋肉ダルマ (kinniku daruma) which is a word for insanely buff guys, like the kind you might see in muscle/bodybuilding competitions. It fits the enemy’s appearance, but I can’t help but feel that the name is a reference to something else – so many of the Japanese enemy names in the game so far have been based on real life mythology, biology, and stuff, after all. Also, during the stream I was suddenly surprised when Dadaluma used a defensive spell on himself – only a few people in the world (outside of Thamasa) should be able to use magic at this point in history, and it’s hard to believe this random throwaway boss would’ve been one of them. He was originally human, but after excessive martial arts training he was reborn as a monster. I guess this explains why he can use magic, but wait, are monsters able to use magic in this world at this point in time? I would think that if magical monsters existed all this time, humans would’ve been using them for stuff ever since the War of the Magi, but we don’t really see that. I dunno, it’s easy to think too deep into this sort of thing, even if it’s fun sometimes. The party reaches the top of a tall building in Zozo. Inside, they find Terra in Esper form and an old man named Ramuh. 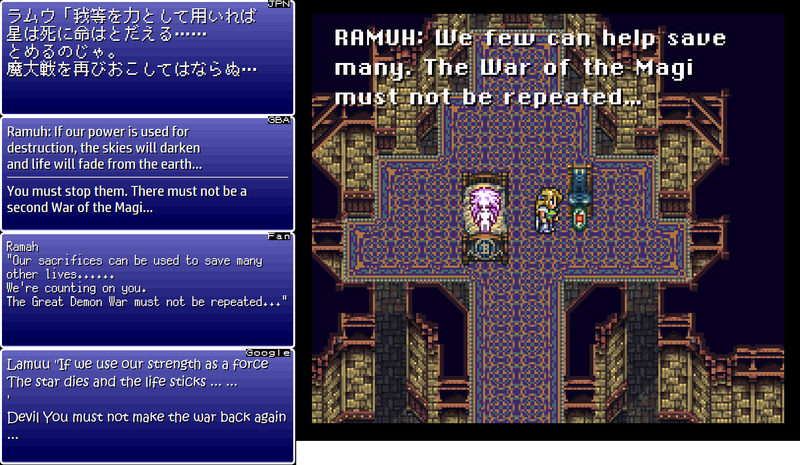 Ramuh spends a lot of time explaining the history between Espers and humans and the nature of Espers. This whole scene is very long and info-dense, so there’s a lot to unpack. Sometimes we live here, taking the shape of humans. You have nothing to fear from us. I just happen to look not very different from humans, which is why I live here. Because I needn’t fear being recognized as an Esper. 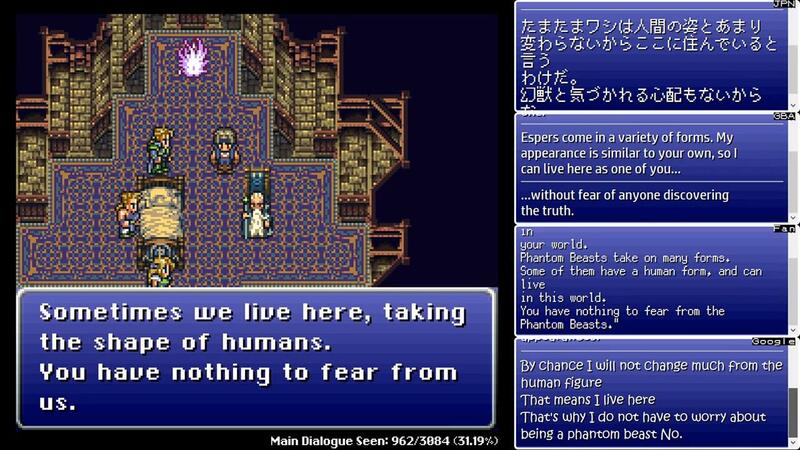 This is a pretty big difference – he’s actually suggesting that he’s a rare exception and that most Espers don’t live among humans, as the Super NES translation indicates. The line about fear/worry is also misdirected – he’s still talking about his personal situation in Japanese, but is comforting the heroes in the Super NES version. Seriously, when you think about it, everything Esper-related that happens in the story is worthy of being worried and scared. Anyway, the GBA translation fixes this big mistake. The fan translation takes the incorrect Super NES translation and just rephrases it to sound different, but isn’t actually a translation. In Japanese, it’s stated that humans and Espers once lived together “in this world”. This seems like a tiny detail, but since we’re about to start talking about multiple realms, worlds, gates, magical barriers, closed-off regions, and such, it’s nice to have a good foundation to work from. Every translation but the Google translation drops this detail. Again, not a big deal, but I wanted to mention it for now. The Japanese script says that humans and Espers “lived” together. Every translation gets this right except for the fan translation, which for some reason says they “worked” together. According to the Japanese script, after the Espers decided to break away from the humans, they erected a magical barrier and established what they considered their own “realm”. It wasn’t actually a separate world/dimension as the Super NES translation suggests – it was presumably just some place in this world they called their own. At one point in the official translations, Ramuh explains about how Espers have Magitek power… except that’s kind of weird, as the Magitek name has always sort of implied that it’s a combination of the Empire’s technology with magic. Translating 魔導 (madō) as “Magitek” probably seemed like a good idea at the start of the game, but as we learn more about the nature of magic in the world, that translation choice is starting to exhibit some flaws. Of course, most players probably don’t analyze the script at this level, so it’s not a huge deal. It’s explained that one day some people stumbled into the Esper realm. I always thought it was weird that humans would randomly wander into an alternate world or dimension, but now that we know it’s just some enclosed area in the normal world, it makes much more sense. It makes me wonder what the magic barrier was meant to do, though – was it just some kind of big camouflage field or invisibility cloak or something? After humans did a bunch of stuff in the Esper realm, that’s when the Espers decided to build an actual, physical gate blocking entrance into their realm. So the original barrier and the big mountain gate aren’t one and the same. 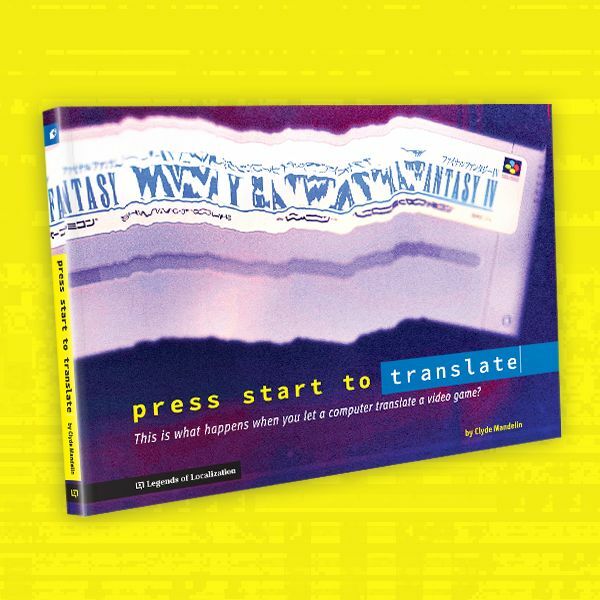 If any of this information is new to you, it’s probably because the details are missing from many of the translations, particularly the Super NES and fan translations. The Super NES version mistranslates the line as: “That’s right, relax.” And, as we can see, the fan translation is a copy of the incorrect Super NES line. Only the GBA translation gets this line correct. Even the machine translation gets it better than the SNES and fan versions. On a side note, I asked during the stream what this “Ramuh” name comes from. I think there were some theories, but nothing definitive. 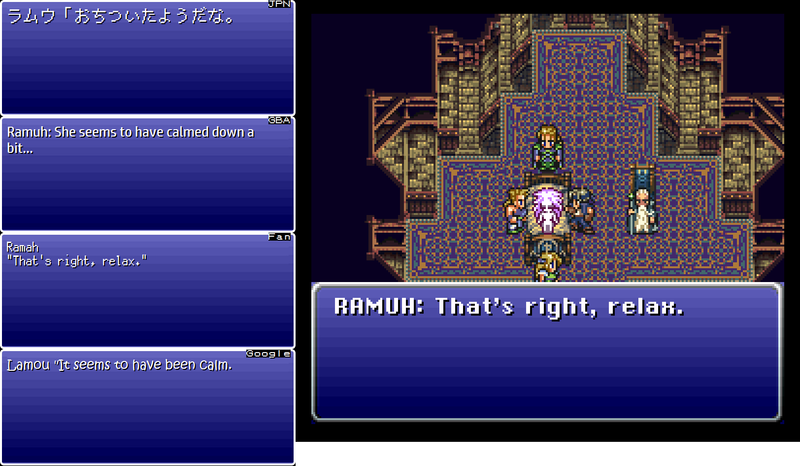 After checking the Final Fantasy Wiki about Ramuh, it seems there isn’t a clear consensus on what Ramuh is based on. But after visiting that page, I was flabbergasted by how many Final Fantasy games he’s been in. Seriously, give it a look – it’s insane. Just when I think the list is about to end, it keeps going! I abandoned my comrades, escaped by myself, and have been living in hiding here ever since. But now that’s come to an end. The final sentence means that his time of living in hiding is now over. The exact reason why isn’t made clear, but there are a number of possible reasons: he’s just been discovered by humans, when he called out to Terra with magic he revealed his existence, he’s already decided to turn himself into Magicite for the heroes, and so on. Like a coward, I escaped leaving the others there. It’ll be the end of them. The idea that he escaped is mentioned, but the fact that he’s been living in secrecy is left out. 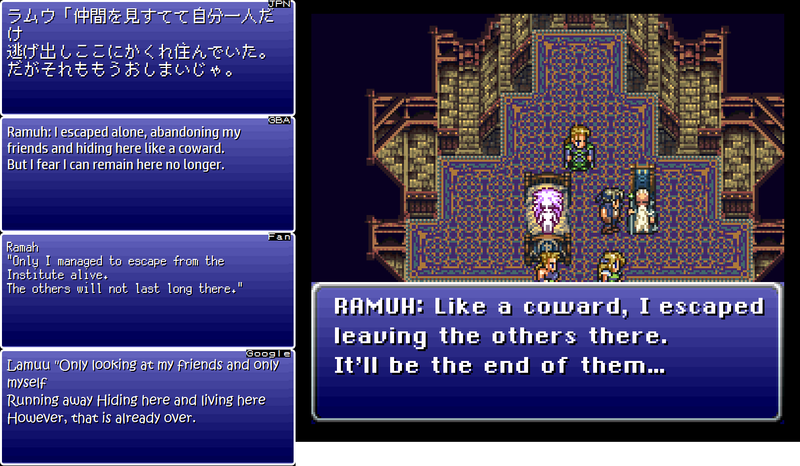 And, as we saw earlier, the fact that Ramuh happens to look human helps him blend in… but that fact was also left out of the Super NES translation. I normally would’ve assumed these details were dropped due to memory constraints, but then the final line about “coming to an end” is mistranslated in a way that indicates the missing details are missing because they too were misunderstood and mistranslated. The GBA translation fixes all of these mistakes and ties all the details back together. The fan translation rephrases the Super NES translation but manages to drop even more information. It’s now no longer stated that Ramuh willfully abandoned his fellow Espers. When Espers die, they leave behind a magical object that contains their essence. In the Japanese version of Final Fantasy VI , these objects are called 魔石 (maseki). The first character is our troublesome old friend ma, which can be translated in so many ways that it’s like a mini-boss fight for translators. The second character means “rock” or “stone”. So the basic idea is that a maseki is some sort of “magic stone”. You could do what I sometimes call “reverse localization”, which is like #3 and #4 but with a twist: you ask yourself, “If this game was originally written in English, what might it have been called?” and then go with that – in this case, maybe something based on Latin or something from old Western mythology? Modern Final Fantasy localizations use this approach a lot. Note that Method #1 requires the least amount of creativity, and as you go down the list, more creativity is generally involved. Also, these aren’t the only methods that exist – there are probably countless more approaches. Naturally, most fictional, made-up names don’t appear in normal dictionaries. So what do you do when you encounter them in a project? You write your own dictionary. In fact, professional entertainment translators often literally do end up writing huge lists of game/series-specific terms and how they’re handled. Anyway, this is all a long-winded way of saying that there are multiple ways of handling made-up names in translation, and there is no single “correct” way. Everything is a case-by-case thing, and whether one method is better than another in any given case usually comes down to personal opinion. 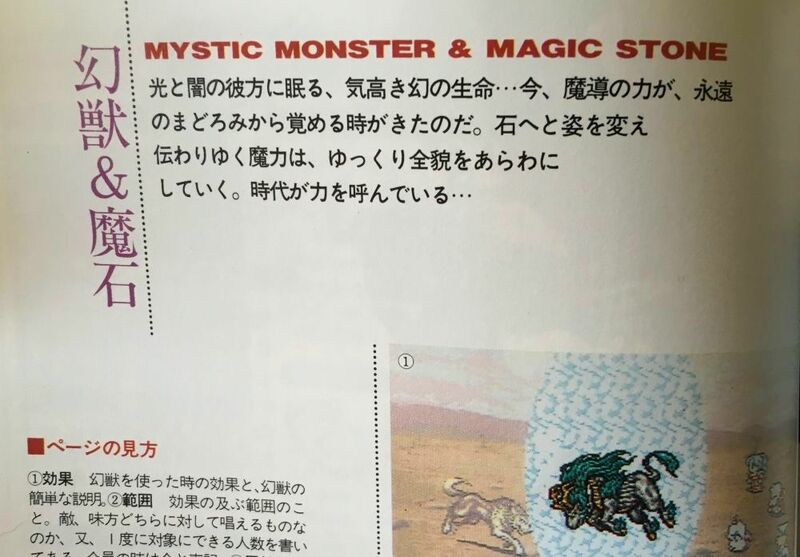 So, consulting the list above, we can see that the Super NES translator went with Method #3 by combining the ideas of “magic” and “stone” to create a new name in English: “Magicite”. This name became so iconic that it was retained in the GBA translation. From what I vaguely recall from like 15 years ago, the fan translators considered Method #2 to be the one and only way to handle made-up names. I feel like this sentiment is common among fan projects in general – that if you absolutely have to translate a name, then Method #2 is the only true way. In this case, the fans used Method #2 to combine “magic” and “rock” into “Magirock”. Again, Method #2 is a legit way to handle made-up names, so when some fans point to “Magirock” and laugh at it, they’re laughing at a legitimate translation choice. 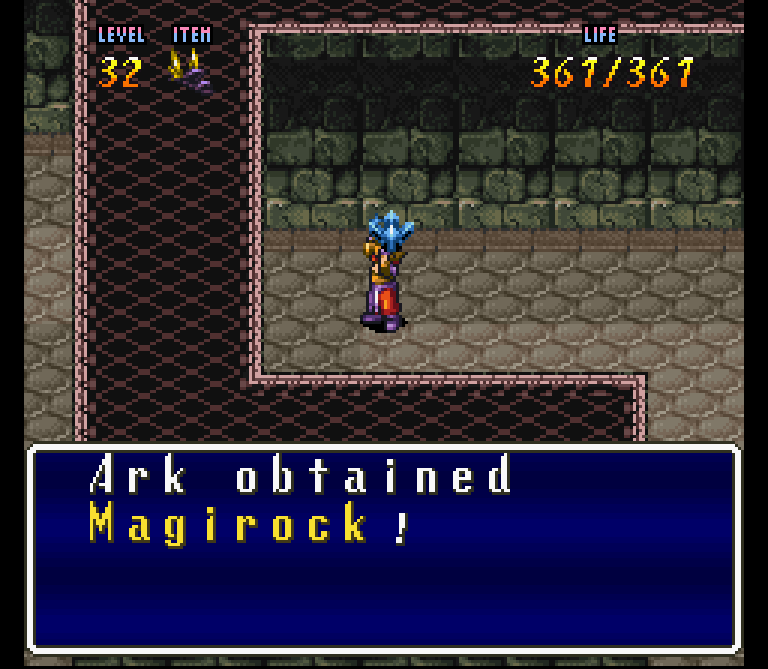 I feel like if the Super NES version had always called it “Magirock”, it would’ve been accepted just fine. Of course, if the fan translators pointed at “Magirock” and proclaimed that it was better than “Magicite”, then that’s a different matter altogether. I don’t remember if they did that, though. There are multiple official Japanese strategy guides that all form a single set. 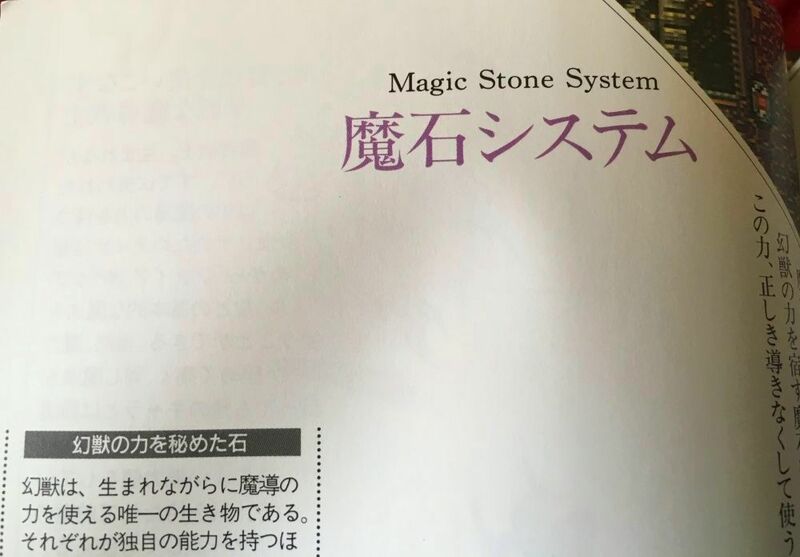 One of these official guides translates maseki into English as "Magic Stone"
A different official guide in the same set also uses the name "Magic Stone". We also see that genjū/Espers are called "mystic monsters"
I prefer the name “Magicite” myself – it’s unique, memorable, and creative. But I wonder if part of my attachment to it is because it was the first name I knew it by. Actually, that’s a phenomenon that deserves its own dedicated article sometime. Can you come up with any new English names for maseki? Share them in the comments – I love seeing how creative fans are! On a different note, just like the word maō, maseki appears in Japanese entertainment all the time and gets translated in different ways all the time. This is why the Google version translates maseki as “Manastone” – there’s probably some other popular game or series out there that translates it that way, so Google equates the two words here. The Super NES translation uses “pass away” instead of “die”, and then slims down the text while trying to keep the original idea intact. The GBA translation untangles the original Japanese sentence a bit further than I did above, and puts “die” back in the line. The fan translation changes the explanation entirely by claiming that spirits are involved and that these spirits are “trapped” in their earthly remains. The original Japanese line has nothing of the sort. In previous streams, we’ve seen the fan translation add stuff about souls when the original text never once mentions them. I’m not sure why the fans felt the need to insert these soul/spirit elements out of nowhere. 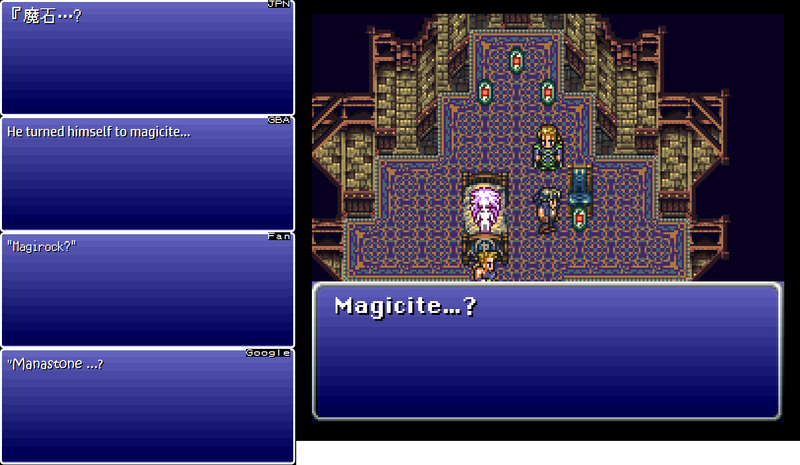 The heroes obtain some Magicite for the very first time. One of these can be used to summon the Esper known as キリン (kirin), which is left as “Kirin” in the official translations and the fan translation. A kirin is a creature from Chinese mythology that’s like a bunch of different animals all combined into one. “Kirin” is how the Chinese name is rendered in Japanese, but apparently it would be rendered in English as something like “qilin”. 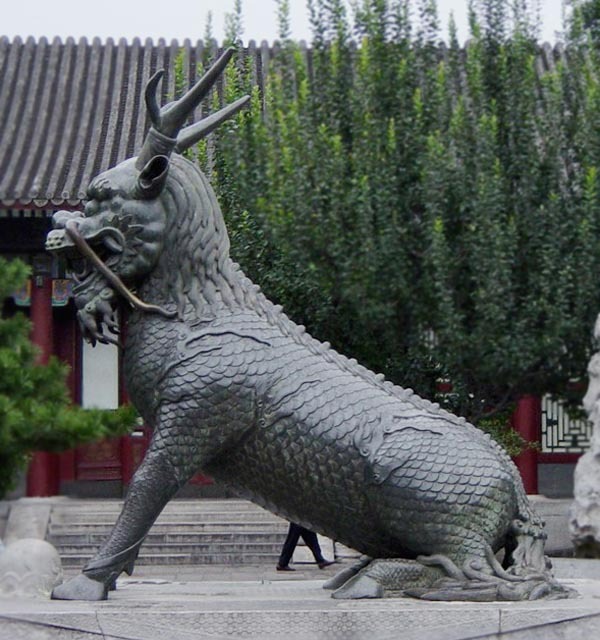 See here for more info on the qilin and its really long history. 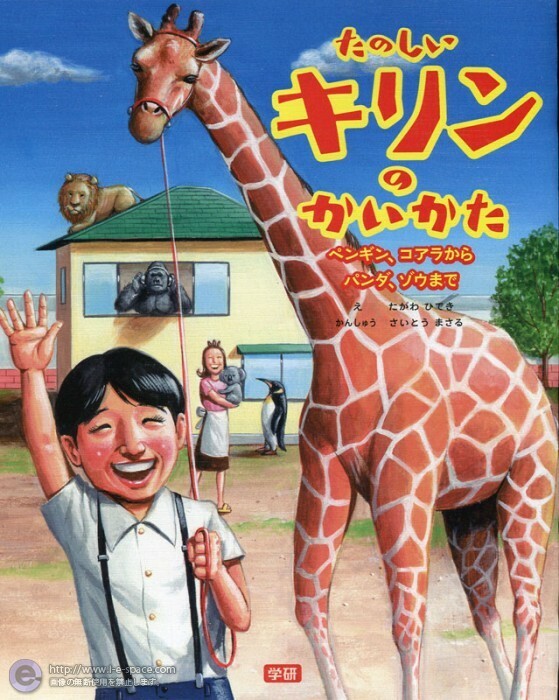 The Japanese word キリン (kirin) also means "giraffe"
It’s usually obvious when you’re talking about the mythical creature and when you’re talking about the actual animal. Google failed to make that determination, though, which is why it thinks we’ve just obtained a magic stone giraffe. The heroes obtain another Esper that’s known as ケットシー (kettoshī). Most translators would probably look at this and be like, “Cetsy? Ketshy? Kettsi?” and go through a whole bunch of other potential name spellings. But in the end, there’s no clear answer because it’s not an English word and not meant to be an English word. Using the Internet, it only takes us like five seconds to realize that ケットシー is how “Cat Sìth” is written in Japanese. Cat Sìth is from Celtic mythology and can have its name written in several different ways in English, including “Cait Sith”, which is what most Final Fantasy fans know it by. After seeing that the Esper is a cat that runs across the screen and then leaves, the translator understood that it was a cat-related Esper and tried to come up with a fitting name – eventually deciding on “Stray”, as in a stray cat. As we’ve seen during the stream, many of the enemy names have followed this same pattern of “I don’t know what this weird Japanese name means, so what does it look like instead?”, so it’s not a stretch to think that it extended beyond just enemies. 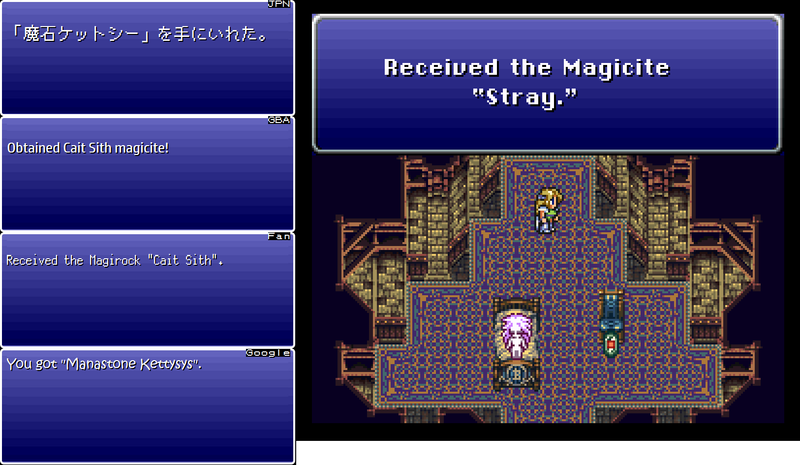 Anyway, that’s my theory on why Cait Sith wound up being called “Stray” in the Super NES translation. The name was fixed in the GBA translation, which calls it “Cait Sith”. And, as I’ve mentioned before, if fan translations excel at anything, it’s usually name research. So this is another example of when the fan translation genuinely fixes an issue found in the official Super NES translation. Similar problems with mythological names appeared in Final Fantasy VII too, but it seems like the translators were able to get more and more names right with each new game in the series afterward. Part of this gradual improvement probably stemmed from increased Internet access, easier communication, and the advent of new online resources like Wikipedia and fan sites. I cover this in more detail during the stream, but basically the GBA translation is the only one to get this line correct. The Super NES translator either misunderstood the slightly odd phrasing, or tried to condense everything down into something as compact as possible. The fan translation simply rephrases the already-rephrased Super NES translation into something that is clearly not said in the original text. The most interesting thing for me, though, is that the GBA translation adds in some extra flair not found in the original with the phrase “the skies will darken”. With that said, I really like how the GBA translator untangled that sentence- it sounds weird and weak as a literal translation: “If (they) use us as a force, the planet will die and life will end…”. We were infused with magic power after being put to sleep, so I don’t clearly remember. The use of “we” makes it seem like multiple people underwent this same procedure all at the same time or within a very short time, one after the other. 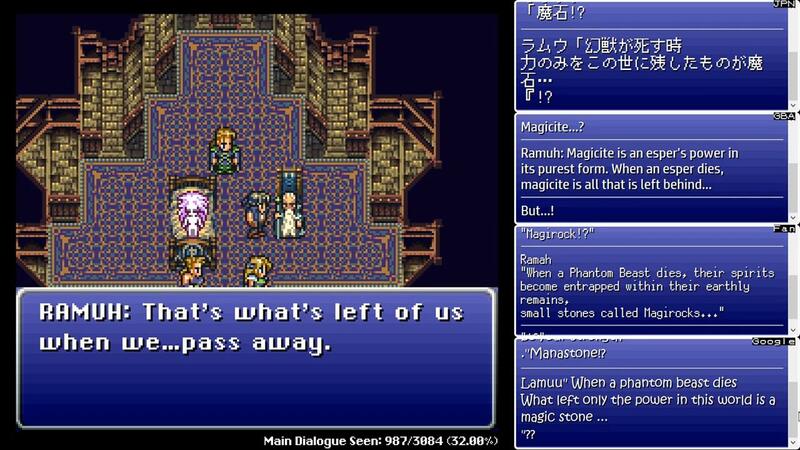 It’s not clear who “we” refers to at this point in the story, but based on Celes’ line back before the Kefka battle in Narshe, it can probably be assumed that Terra is a part of that “we”. The Super NES translation changes this “we” to “me”, which cuts out that interesting little detail about how the Empire conducted its magic-infusing process. The fan translation follows the Super NES translation and says “me” instead of “we” too. Surprisingly, the GBA translation also changes this line slightly enough to drop the “we” detail. Only Google keeps it intact! I’ve never really analyzed the game at this level, so I don’t think most players will ever notice or care about something so minor. But if you’re a real Final Fantasy VI super-fan, these kinds of tiny details might be fun to theorize about or just have fun discussing with other fans. As we saw in the previous article, Locke’s motivation was actually set up back in Kohlingen and Jidoor, but this information was accidentally written out of the Super NES script. In Japanese, he’s after a special “secret treasure” that’s said to be able to call back souls of the dead. What’s more, it’s stated that this secret treasure is currently in the Empire – but this detail was also dropped in the Super NES translation. Anyway, just before the heroes leave Zozo, Locke mentions in Japanese that he’s still looking for this particular “secret treasure” and implies that he’d like to sneak into the Empire in search for it. There’re bound to be treasures there. And besides, I’ve always wanted an inside look at the Empire! In short, Locke’s hopeful search for this “secret treasure” that can bring his lost love back to life has been replaced with a mindless hunger for any treasure at all. And his motivation for going to the Empire has changed too. 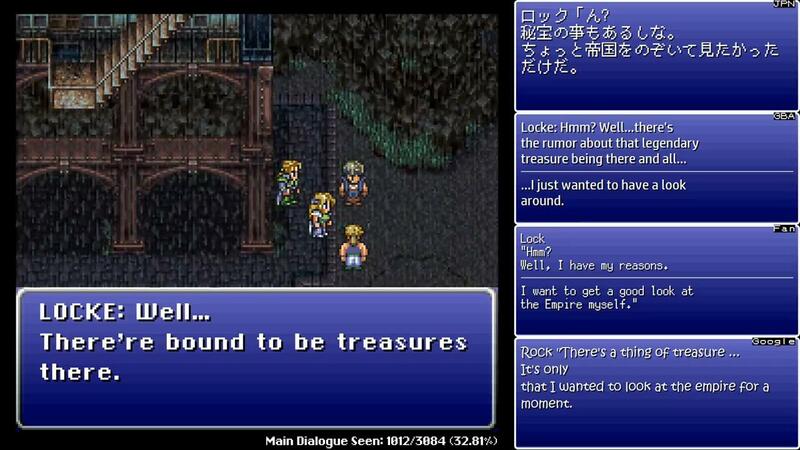 The GBA translation fixes all of these major mistakes and puts Locke’s character motivation back on track. The citizens of Jidoor are mostly rich, fancy-pants aristocrats, and this lady in Jidoor speaks with proper Japanese grammar that matches that vibe. So it came as a surprise to see this lady in Jidoor suddenly start a sentence with “ain’t” in the Super NES translation. At this point in the stream, discussion turned to the word “ain’t” and how adults used to say “ain’t isn’t a real word” or “ain’t isn’t in the dictionary” when we were all children. That attitude seems to have changed a little since then, and it’s most definitely in the dictionary the last time I checked. But I wonder if there’s a new word today that gets the same kind of “that’s not a real word” treatment. There’s no one curious enough to dare visit the Empire’s continent these days. The unstated idea is that going to the Empire’s continent would be like walking straight into trouble. The GBA script rephrases things to sound a little clearer in translation, but makes some minor changes at the same time. The fan translators definitely noticed that the Super NES version of this line was faulty and didn’t use it as a base. But the end result is still a mistranslation – it’s not that going to the Empire’s continent is difficult, but more of a death sentence. So why did this Super NES line get so off track? The line stored immediately after it in the game’s data – which is said by a nearby NPC – says sort of the same thing, but in a more polite tone. Maybe the translator wanted to revise the rough “ain’t” line but accidentally typed some of it into this line? Or maybe the Japanese line changed at some point and the English line reflects the older line? Whatever the case, some sort of mistake happened here. The GBA translation adds a whole second part to this NPC’s line for seemingly no reason. The original Japanese text says nothing about catapults, so I’m not sure where it came from. We’ve seen the GBA translation quietly add text out of nowhere before, mostly to insert low-key pop culture references… but I’m not sure about this one. Is this a reference of some sort? Is there some pop culture connection between the word “catapult” and calling someone “daft”? It’s a mystery to me. There’s an acting troupe at the nearby opera house, and the head of this troupe plays a big part in the upcoming events. He’s the danchō of the acting troupe that’s performing at the opera house. Everyone just calls him “Danchō”. This makes perfect sense in Japanese, but it’s problematic in translation because the word danchō doesn’t exist in English. Leaving his name as “Dancho” would break the logical connection that exists in the original script, so the Super NES translator tried to find a good, single English word that can mean “troupe leader”. Based on this weird mistake we noticed back on the Phantom Train, my theory is that the Super NES translator had temporarily renamed this troupe leader “Conductor”. But then later on, the translator probably discovered that the troupe leader isn’t the actual music/play conductor and came up with the more appropriate name of “Impresario”, a word which apparently means “a person who organizes and often finances concerts, plays, or operas”. 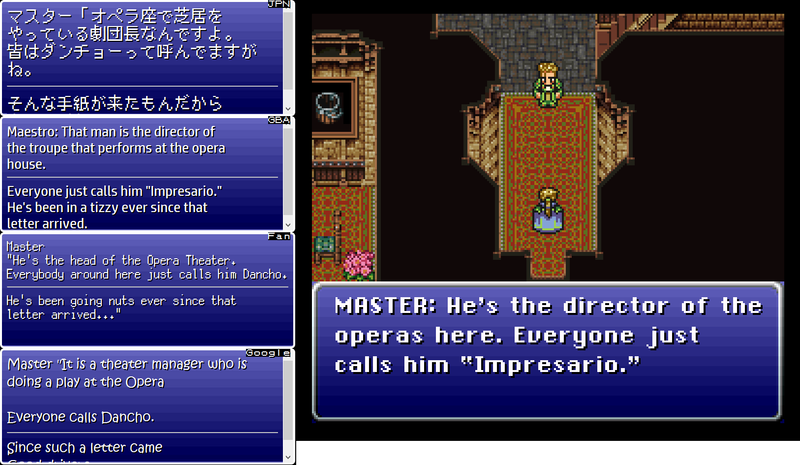 This was the first time I’d ever heard the word “impresario” in my life, so whenever I hear the term I immediately think of Final Fantasy VI now – it’s that memorable. I assume many other fans had the same experience, so it’s no surprise that the GBA translation retains the “Impresario” name. In the fan translation and the machine translation, we can see that the troupe leader’s name is left unlocalized as “Dancho”. The explanation behind his name is lost in translation, but since the fan translation feels primarily targeted at fans already familiar with the game, it’s only a minor detail that’s quickly overlooked and forgotten. The Super NES translation does an impressive job of trying to touch on all the main points brought up in the Japanese script, while also condensing the text to fit within the English game’s tight length limitations. A chatter in the stream also asked if this translation is wrong because the word “blackjack” is used in terms of the card game and not as the name of the airship. My instinct says this change wasn’t due to a misunderstanding, as “Blackjack” is clearly labeled as a ship in the Japanese text. The GBA translation is granted a little more breathing room, so it’s able to say more than the Super NES translation, but still not quite as much as the Japanese script. The text was rephrased to sound more natural in English but hits all the main points in the Japanese script. Except for the fact that the Blackjack has an entire gambling area on it – that detail gets cut out. The fan translation clearly tries to do its own thing and not borrow from the Super NES translation, but it makes some basic mistakes in the process. The Japanese script essentially says that good and bad don’t mean anything to Setzer – he’s basically a free spirit whose worldview is based entirely on the luck of the draw. But the fan translation emphasizes that Setzer is “free from the wiles of justice” and that he’s “without scruples”. This suggests that he’s a criminal at heart with contempt for law and justice. Of course, soon after this, Setzer does interrupt the opera and kidnap a woman, so the fan translation description fits in that situation. But when we finally do meet Setzer and learn about his past, we see that he’s not some vile criminal. Nor is he a good guy. He’s just a free spirit who does his own thing, regardless of what’s considered right or wrong. That important character trait is missing from the fan translation’s description. This man in Jidoor goes on to explain that Setzer owns the only airship in the world. Every translation gets this detail right but the fan translation. 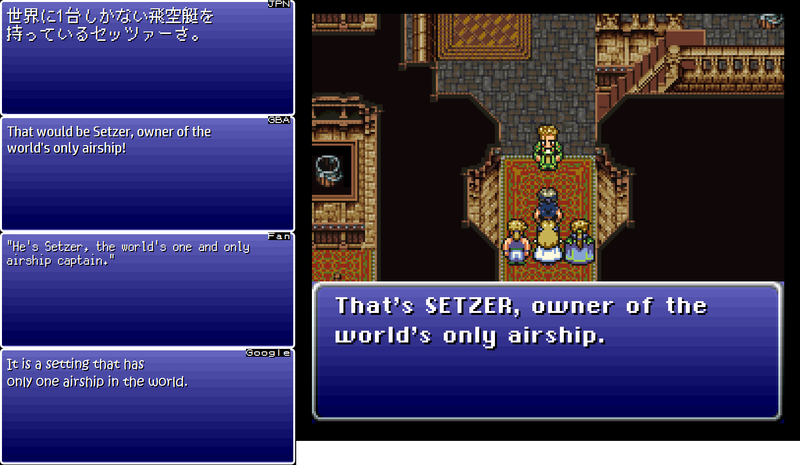 Instead, the fan script says that Setzer is “the world’s one and only airship captain”. At first glance, this phrasing doesn’t seem problematic, but the new wording opens up the possibility that there could be a million airships in the world. It reminds me of when someone accidentally opens up a legal loophole because of poor wording in a contract. As we learn over time, the fact that the Blackjack is the only airship in the world makes it extremely special. And then we later learn that it’s only unique now because of a tragic event years earlier. Of course, the fan script’s implication that Setzer is the only one who can pilot airships keeps it in line with the fact that the heroes will still need his help. But it’s still a mistranslation of the original line to begin with. On a separate note, in English, we occasionally use “counter words” when giving a specific number of things. 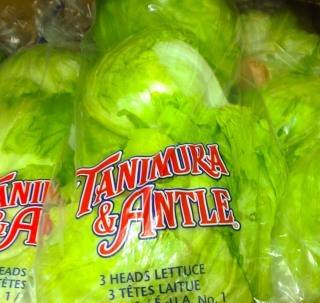 For example, we say “3 heads of lettuce” when counting lettuce. Japanese does the same thing, but with basically every word. This topic is kind of complicated and takes a long time to learn, but there’s a good overview on Wikipedia here. Anyway, in Japanese, ships are generally counted using the word 隻 (seki), so you might think that airships would also be counted using seki. But as we can see in this line in the Japanese script, airships are apparently counted using the word 台 (dai), which is usually used for things like cars, bicycles, some machines, and even household appliances. Since I didn’t grow up in Japan or speak Japanese natively, I probably never would’ve guessed that airships would be counted this way. Since these kinds of airships are fictional, maybe other games use a different counter word – I feel like airships built for war might use a different counter, for example. I haven’t looked any deeper into how to count airships though, so if anyone knows more, let me know in the comments! For anyone wondering, if Japanese Wikipedia article for List of Zeppelins is to be believed, 隻 is the count word for (lighter than) air ships as well as naval ships. In most FF titles, monsters are naturally born creations of the world, so they possess the ability to magic (and in VI’s case, some World of Balance monsters can cast magic). Humans are generally treated as outliers, and so we usually need some external means to wield spells. The Kirin bit reminds me of how they wrote the name as Kylin in SaGa Frontier. I can’t wait until you cover the actual opera. I’ve heard a live concert version of the opera that uses the lyrics from the GBA translation. I wonder how many versions there are. I can only think the “catapult” mention refers to Secret of Mana’s ‘cannon travel’ system, as it is equally absurd. Given the intro explicitly mentions gunpowder (which is completely absent elsewhere), they could have been more exact if that was their intent. I, too, immediately presumed it was a Secret of Mana joke, and wouldn’t have even questioned that interpretation had I not read this article. They could have used the word “cannon,” but I forget, does this FF game have cannons in their world? 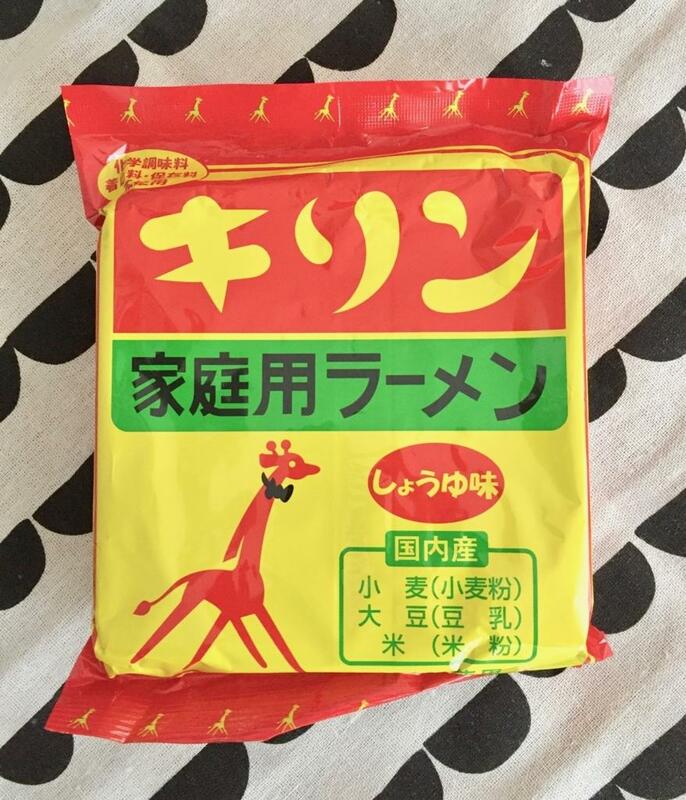 I’ve had beef ramen, shrimp ramen, and chicken ramen, but never giraffe ramen. As controversial as Woolsey is, FFIII US is the best so far in terms of item and spell naming. In the first two US games “Heal” could mean Potion, the spell that is actually named Heal, Esuna, or Remedy. 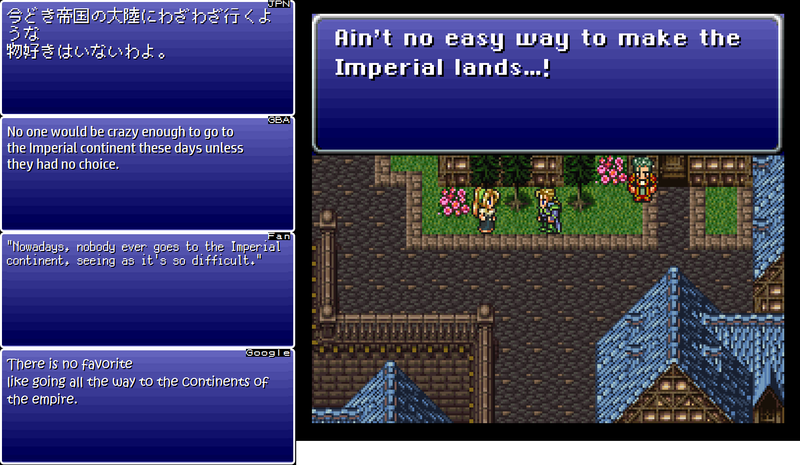 FFIII US still makes the mistake of calling Esuna “Remedy” however. Potion becomes “Tonic” but it’s still better than previous naming abuse. 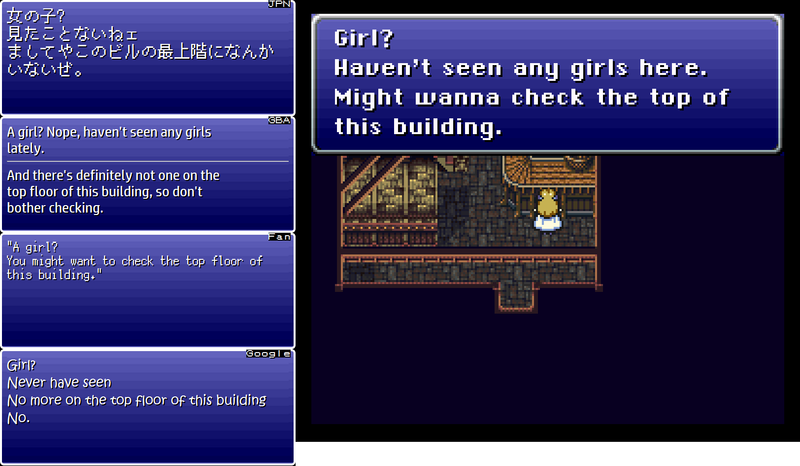 The even more controversial Final Fantasy VII translation does an even better job in this aspect. Regarding a new word that is today’s “ain’t”, it’s not exactly the same thing but I was somewhat amused to see Locke correctly saying “there’re” in the Zozo dialogue considering that usage is gradually morphing to “there’s” for all cases despite the protests from the grammar police. 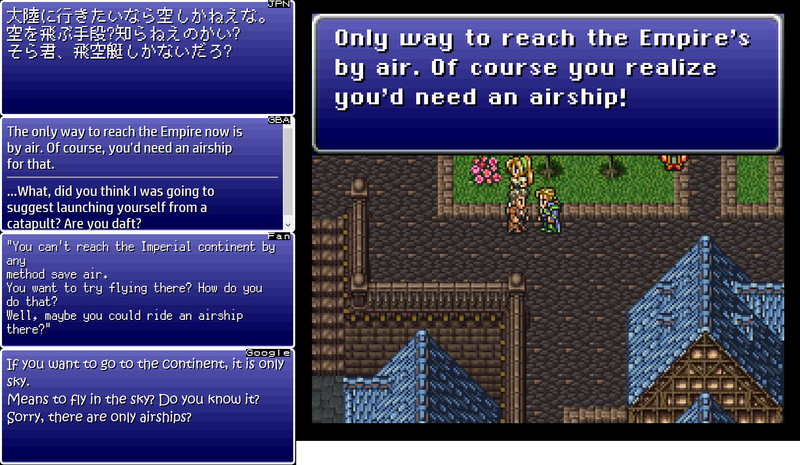 As for counting different types of airships, there is a slight possibility that there is an answer in Final Fantasy II, the NES one, as there is an airship and a warship, but only one of each. It was funny looking at the Ramuh article and realizing that I haven’t even heard of half the games. Maseki could be called crystal essence, or even crystalized essence, if you want to be a bit more creative. Maybe a bit of a stretch here, but could the “catapult” reference be reference to the area in FFV named Catapult where you find one of the airships? There also happens to be a scene in the gba version of FFV where Faris calls Lenna daft for asking if they are sisters ( https://www.youtube.com/watch?v=IuVJqhSJY20 2:15 of this video is the scene) , I vaguely remember this particular scene getting some attention on the message boards at the time because of the use of the word daft. This of could of course all be complete coincidence, but it’s what immediately came to mind after having just replayed FFV. 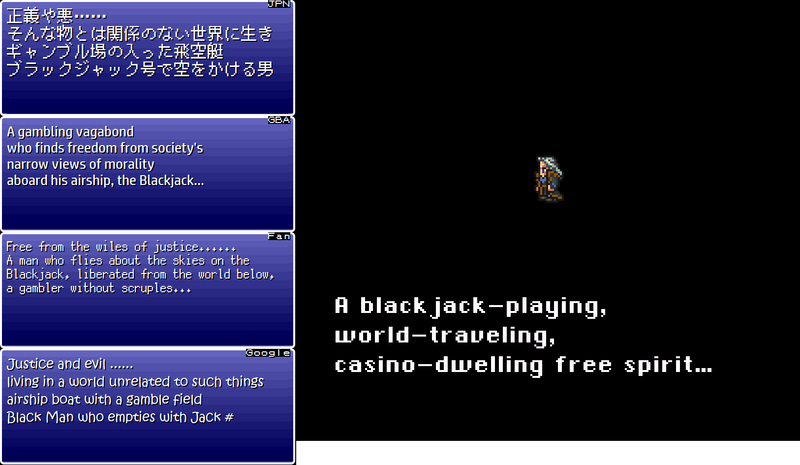 Seeing the word “daft” in an American English 90s RPG translation feels so surreal. By the way, I’ve recently been thinking about how “obscure” Japanese cultural references are taken for granted by the Japanese audience, and wondered how many cultural references we take for granted. The first one that comes to mind is the Mousemallows from Viva Pinata living in a clock. It’s a reference to the Three Blind Mice, which like most nursery rhymes, isn’t well-known outside of the UK. Really? I’m Canadian and most North Americans I’ve ever met seem to know a fair amount of nursery rhymes, with Three Blind Mice being a particularly well-known one. 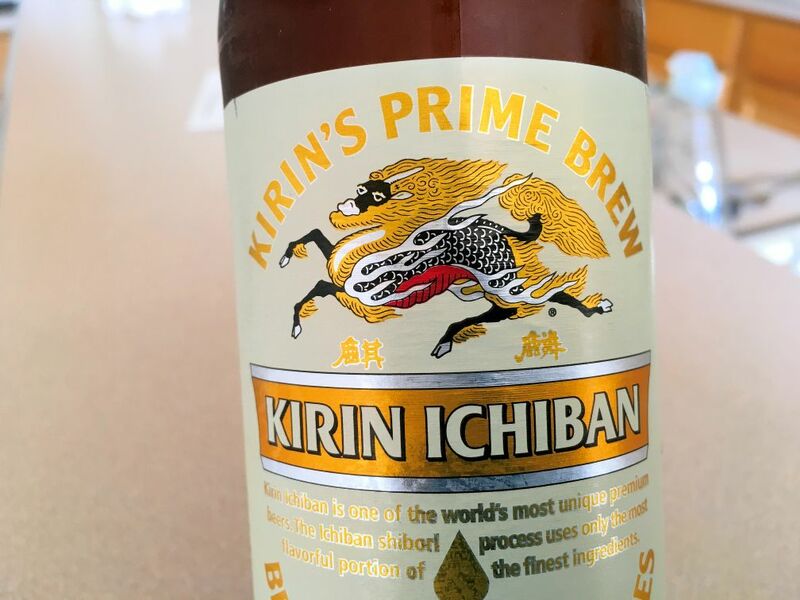 For what it’s worth, the Kirin is a monster found in Dungeons & Dragons also, under the slight variant spelling Ki-rin. Given the heavy influence D&D had on Final Fantasy, I’d be unsurprised if that’s where it came from. Another animal named after a mythical creature in Japanese is the tapir, which was named “baku” after the dream-eating yokai. Examples of Baku in video games include Drowzee/Hypno and Munna/Musharna from Pokémon, and Bagoo from Klonoa: Empire of Dreams. And Luna from Animal Crossing: New Leaf. There are Hill Gigases in FF1, but both the sprite and general idea of them being big and very powerful enemies for this point in the game is clearly based on the different-looking ones from FF2. In FF1 they were’t very threatening and traveled in huge packs. While it’s definitely not intended, I like to think of the ain’t woman as a southern belle who’s confident enough of her station to not care about arbitrary shibboleths. Also, the way the fan translation renders it, you’d think that “Dancho” was the person’s actual name. 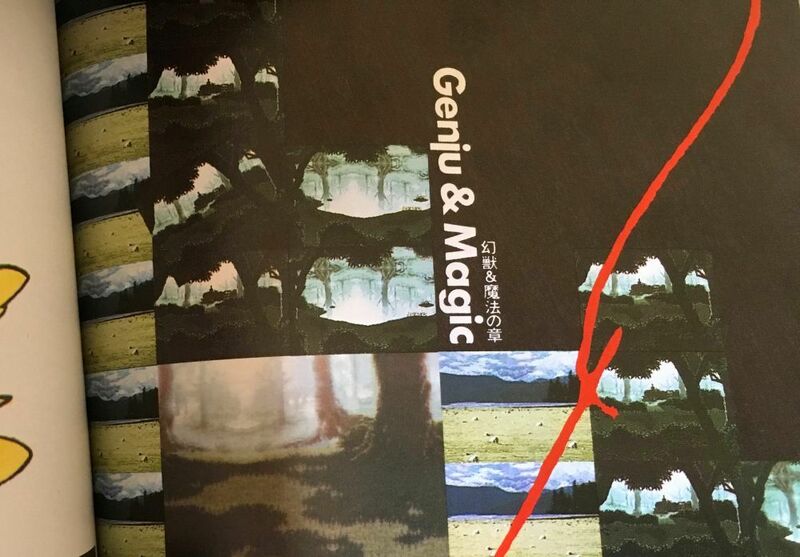 Terranigma’s “Magirocks” are known as プライムブルー (Prime Blue) in the Japanese version. Perhaps they thought the name was weak or they wanted to clearly differentiate them from the similar term クリスタルブルー (Crystal Blue) which are seen in the sky in the opening village. Additionally, the Magishops are known as Prime Blue Shops. However, they forgot to change the menu graphic were you store your magirocks, as it still says Prime Blue there. Oops, I guess they didn’t notice. As an English major, “irregardless” boils my blood. Also, I think the “catapult” thing might be a Secret of Mana reference? That’s a great example. Also, I can’t believe how often I hear people say “expecially”. Regarding the fan translation getting Cait Sith right, their translation was made after FF7 came out, right? So they had access to other works by Square where the term had been used and could reference an “official” translation for it as a recurring term (hence why it’s Cait Sith and not Cat Sith.) I imagine that’s a common advantage when going back and revising old translations. According to the wiki, the name had previously been used for an obscure enemy in FF4, translated as “Panther”, but there’s no particular reason why Woosley would know about that (especially without Wikipedia and the like.) The usage in FF7 was much more prominent and made it clear the term was part of Final Fantasy lore. I guess it’s obscure from a lore point of view but as a player I’d say Cait Sith/Panther is one of the more notable enemies given that it’s an early-ish enemy that can insta-kill party members and you have to fight it during the period where you’re nerfed in the Loadstone Cavern / Magnetic Cave. Cait Sith was mistranslated all the way up until FF7, so for that reason, I believe most people these days link the name Cait Sith specifically to the character in FF7 since it’s such an iconic character and that’s the first time most people would have heard that name. I remember seeing the name in one of the fan translations and wondering why they used the FF7 character name for a random cat enemy, but now it makes a lot of sense. I’m surprised how much the fan translation is taking from the SNES translation in this section– inheriting the mistranslations and all! I remember a few lines like this being pointed out in the FF4 fan translation too… I wonder how common this practice was. Obviously it can’t have happened in things that had no official translation at the time of release, but for things that did, was it common for fan translators to give up when they encountered something difficult and just rephrase the official translation? That’s my takeaway with these overviews. It’d be interesting to look at the Chrono Trigger retranslation. Being from 2008, it’s from a much later era than the two Final Fantasies we’ve looked at. I haven’t looked much at it, but I believe it’s relatively accurate – but it’s also a “fan translation” that started out as a website that went through every bit of text in the game and translated it for the benefit of people that were interested in what the original script said, much like Mato’s FF4 project. Unfortunately someone got the bright idea to just take this translation, edit it into the rom and release it as a retranslation patch, clunky English and all, so today it mostly exists as something that annoying people can point at while screaming that accurate translations are bad and that all good translations should toss out as much of the original script as possible and replace it with stuff they make up, or whatever it is their argument is supposed to be. The website for the retranslation (https://www.chronocompendium.com/Term/Retranslation.html) never suggests the patch was made by someone else. Also, complaining about clunky technically-English text is quite a far way away from saying that translations should always throw out as much as possible. I don’t know who made it. Maybe it was requested because it’s easier to read lines in context if you actually have them in the game. I’m fairly unfamiliar with the project as a whole. >Also, complaining about clunky technically-English text is quite a far way away from saying that translations should always throw out as much as possible. It is, but that’s not what was happening – people were literally pointing to this translation as “evidence” that staying accurate to the original text is bad, using it to defend things like those modern Fire Emblem translations that toss out huge chunks of dialogue and replace it with the translator’s fanfiction because “it’s impossible to translate from Japanese and have it read well”. It’s the same kind of people that complained about Slattery’s FF6 translation being “dry” or “boring” or whatever (read: “not Woolsey”) and used that as “proof” that translations shouldn’t try to be accurate. Yes, these people are obviously fanboys of various not-very-accurate official translations looking for anything they can use to defend such practices, and they obviously don’t know much about neither Japanese or translation in general, but it’s still annoyingly common to see, and things like that Chrono Trigger retranslation patch just serves as ammunition for these kinds of arguments. Terra was not part of the “we”; she was not infused with magic at any point (why would she need to be?) The other half of the “we” was Kefka. Was it just her and Kefka, or did the Empire infuse huge numbers of soldiers at once? Definitely there are generic imperial enemies that use magic in combat, so this implies that they infused large numbers of soldiers at some point, but I think exactly how widespread it was is a bit debatable. Speaking of which, although this article mentions the boss, my big memory for “enemy that uses magic when it shouldn’t, lorewise” is the Veil Dancers / Slam Dancers in Zozo. They’re just random enemies, yet they fight using mainly tier 2 ‘-ga’ offensive magic, before anyone knows about Magicite. Granted, their sprite conceals their features entirely with veils, so perhaps they’re humanoid monsters? They also only use magic when alone, so they might be hiding their capabilities for some reason. It’s also not impossible that other escapees from the research facility turned into Magicite and were found, I guess? I actually found it disappointing that the original Japanese suggests that Celes and Kefka were part of one group of people who were all infused with magic at the same time, because I always thought a key part of Kefka’s backstory was that he was the first person that operation was tested on, and because the Empire didn’t fully understand the process yet, and their methods for doing it were still incomplete, it made him basically lose his mind, and it was the reason he became the way that he is by the time FF6’s plot begins. (There’s a guy in a pub in Vector who even tells you as much.) Apparently, though, the reason Kefka went insane when Celes didn’t was supposed to be either that Celes was more strong-willed, or just dumb luck. I also always thought that Terra wasn’t ever put through that process, but rather, she had the ability to use magic because her father was an Esper. I’m not sure anymore, though. And it always kind of bugged me, as well, that even though the game makes such a big deal about how only Magicite can allow humans to use magic, you frequently run into enemies that look human, but inexplicably have the ability to use magic against you. Come to think of it, though, Gau’s Rages are an even bigger plot hole. One of the first Rages you can get is an enemy called a “Templar”. When you face that enemy in combat, it’s an armored soldier wielding an axe, and it only uses physical attacks. However, when Gau imitates it, he suddenly gains the ability to cast Fire 2, despite not only his own lack of Magicite, but the fact that the enemy he’s copying couldn’t even use magic in the first place! Yeah, it’s specified that Kefka was the first one, which would mean that he was the ONLY one at the time. Though by the time Celes came around, there are more soldiers who have magic and she was probably infused in a group with more of those. I’m glad you referenced this, because it had been bothering me. 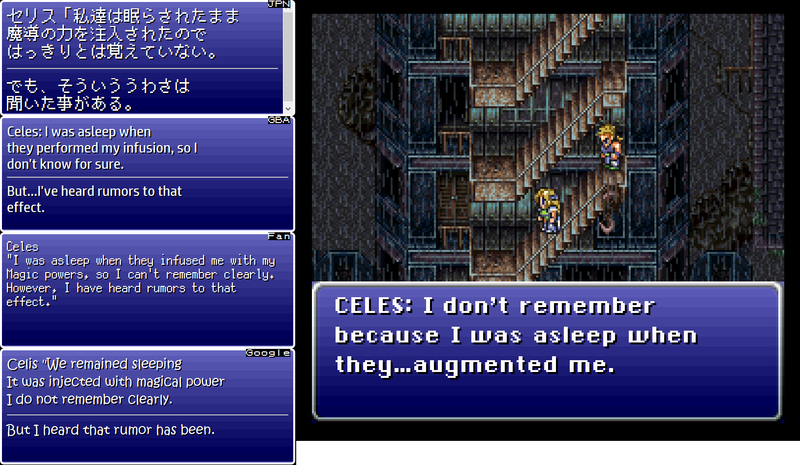 That said, it COULD be the case that if there was already a connection between Terra and Celes in the original script (as referenced in the scene in Narshe) the use of a “we” that includes Terra is a misunderstanding on Celes’ part. In other words, Celes assumed that the other girl who could cast magic was augmented at the same time (after all, Celes just said she didn’t really remember it). If we assume that Emperor Gestahl wanted to hide the presence of a half-human, half-Esper that the best way to do so would be to raise her as though she was a recently-infused Magitek soldier. In a broader sense, I never got the impression that Kefka and Celes were the only two people in Vector who were publicly known to have magic power, so the idea of a general “we” referring to an ambiguous number of individuals infused doesn’t seem so out of line. I mean, the whole Magitek Research Facility is full of dudes who can cast magic, the Emperor himself can cast Merton (for some reason…), and there’s a small child walking around town who can cast cure. I think the Empire’s pretty magical at this point. Oh, regarding Dadaluma, I just recalled – when I first played, I read his name as a play on the Dalai Lama and, therefore, as a joke about how he presented himself as peaceful before attacking. Hello, Mato! It’s always nice to see one of these articles. 1. As Yglorba mentioned above, the Slam Dancers in Zozo use -ara (tier 2) level spells. 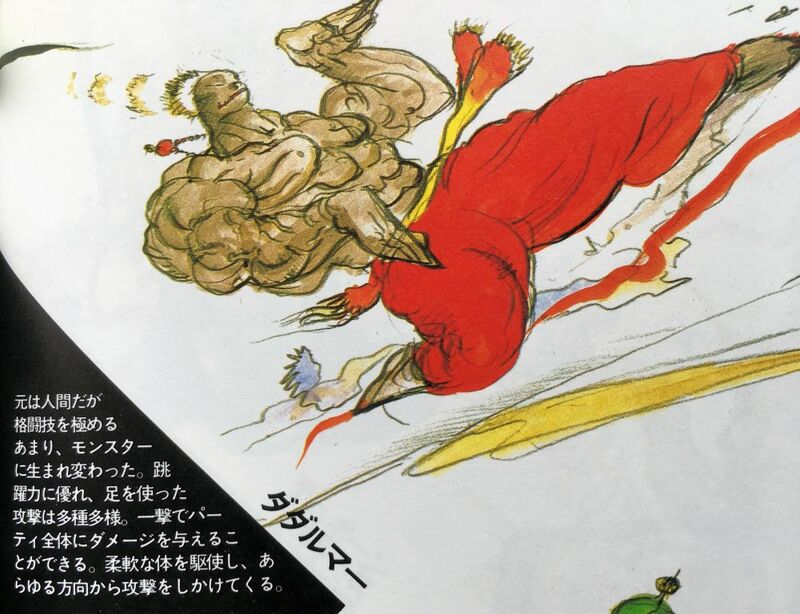 During the first trip to Zozo, their single-target spells OHKO characters in a normally leveled party, making them one of the most dangerous random enemies in FF6. 2. Ghosts in the Phantom Forest use Fire. 3. Liches in the Cave to the Sealed Gate cast Fire and Firaga. 4. Ultros can use Drain or Fire in the second battle. In the third battle, he casts Haste and Protect on himself. He can also counter with any of the -aga (tier 3) spells after a certain point. 5. Cloud (not to be confused with the FF7 protagonist) can cast Drain. 6. Whisper can cast Gravity. 7. FlameEater can cast Protect, Reflect, Fire, Fira, Flare, and Graviga. Ultima Weapon, Naude, and Naughty can cast spells, but I separated them from the above since they come on the Floating Continent. There are also monsters that can use Blue Magic / Lores as well, such as White Wind. So while it’s fairly uncommon for enemies in the World of Balance to use magic, it shows that there are multiple cases of monsters able to use magic. I was always under the impression that it was only a big deal that humans could use magic; after all, that’s why Locke and Edgar are so shocked to see Terra casting Fire early on, and why the game makes a big deal about the Empire infusing humans with magic. The reason I bring this up is because it was parodied in Yu-Gi-Oh! The Abridged Series, which was really big in the mid-late 2000s. The TAS episode covering the duel was posted online on September 18, 2006, while FF6 Advance was released in North America in 2007. Since Speedy Cat was also referenced, Slattery might have referenced this meme as well. While we’re on the subject of Yu-Gi-Oh!, it also has an example of a kirin: Majespecter Unicorn – Kirin. It was such a nuisance that it actually got banned from tournament play! As Jason said above, Terra wasn’t infused; after all, she can naturally use Magic. 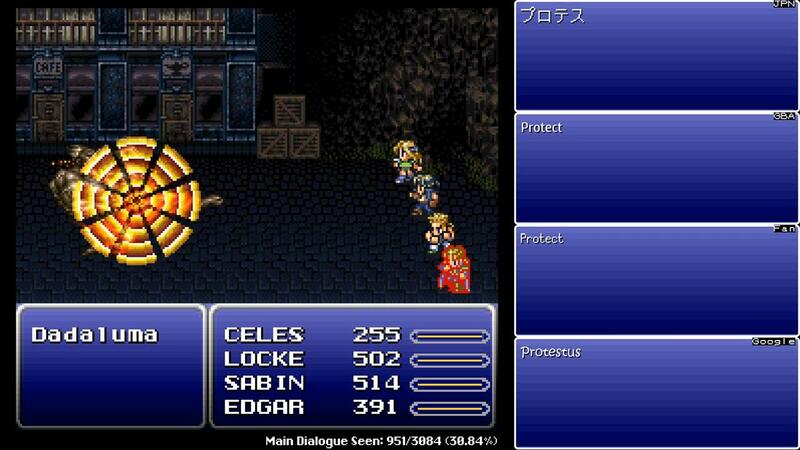 The only confirmed people are Celes, Kefka, and a young boy in Vector who can cast Cure on the party. As a NPC in Vector says (in the GBA version at least), Kefka was the first to undergo the process, but lost his sanity since it wasn’t perfected yet. The others underwent the process after it was perfected. Nice work, can’t wait for the Opera analysis. 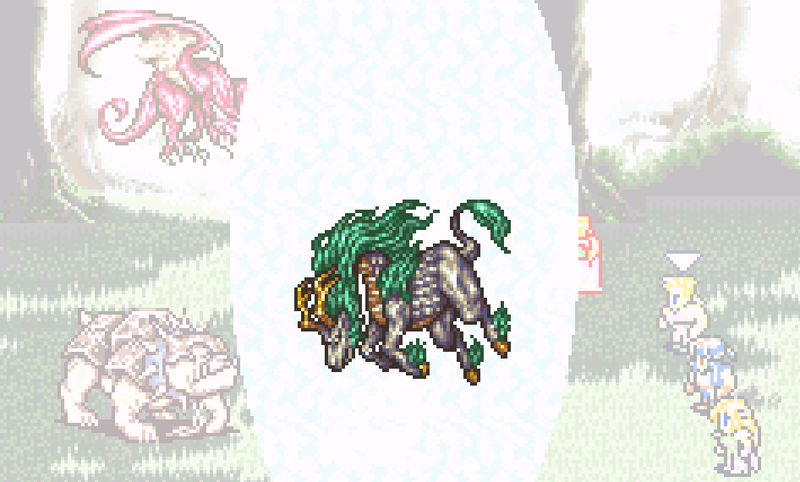 I think one thing that’s strange about the Final Fantasy series is that the names it uses for monsters are actually one of the hardest things in it to translate, because they incorporate so many obscure references to literature and mythology from different languages and different cultures. We probably have Yoshitaka Amano’s artistic interests to thank for that, and translators not having enough time or resources to research those things was how we got “Chupon” instead of “Typhon” in the SNES release of FF6, and “Valvalis” instead of “Barbariccia” in the SNES release of FF4. However, there are also many names for monsters that, as far as anyone can tell, are just nonsense, and you could spend forever trying to chase down a deeper meaning to them that’s just not there. Most RPGs use much more prosaic names (and much more prosaic concepts) for monsters in the original Japanese: you’ll probably see a slime that’s just called “Slime” (or maybe “Jelly” if the developers were feeling particularly wild,) and then a goblin that’s just called “Goblin”, and then a red dragon that’s just called “Red Dragon”…. 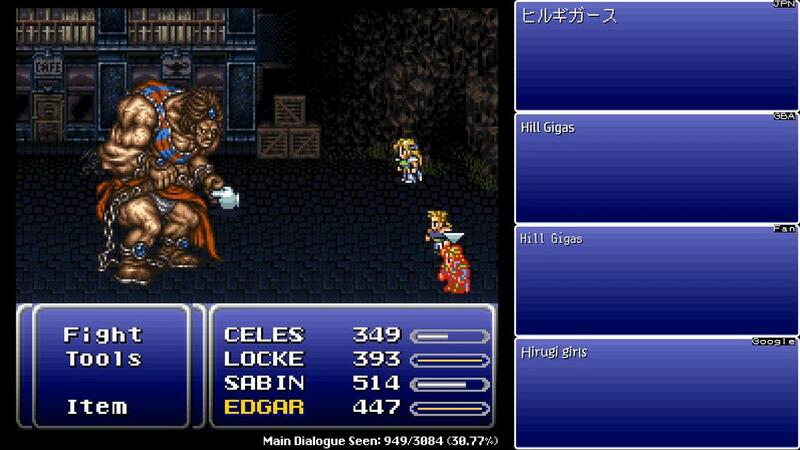 In the English release of FF7, by contrast, most enemies’ names are just a romanization of whatever their names were in the original Japanese, and sometimes, the translators didn’t even seem to notice that a monster’s name originally came from English, and they used their own idiosyncratic way of romanizing it instead of the English word (for instance, 「コカトリス」 was translated as “Cokatolis” instead of “Cockatrice”.) This also led to a lot of monster names that are just incomprehensible, like “Kyuvilduns”, “Jayjujayme”, and “Pollensalta”. I once saw a thread on a web forum where some people who were working on a retranslation project for FF7 were trying to figure out the logic behind some of the more obscure monster names, and it was fascinating but sad to see, because with most of those names, it’s obvious that they’re all just chasing their own footprints in circles. They manage to brainstorm a lot of ideas about where each name might have come from, but they have no certainty of whether any of those ideas are correct, or whether any of the names really mean anything at all. Or another example of the FF7 translators misinterpreting a name that originally came from English is “Bizarro Sephiroth”, which actually makes me sad to see, because it’s so close to being not just a good translation, but a good localization making use of a reference to the culture it’s made for, but it all goes wrong because of a misunderstanding of a very subtle point. The name of that form of Sephiroth in Japanese is 「リバース・セフィロス」, which is apparently meant to be interpreted as “Rebirth Sephiroth”, because at the time you fight him, he’s in a sort of process of transformation into a being that has godlike powers because of absorbing the power of the Lifestream. Unfortunately, the translators interpreted 「リバース」 as “reverse” (which is a much more commonly used word than “rebirth”, and which would actually be written with the same katakana as “rebirth”.) If the intent of the original name had been that, as “Reverse Sephiroth”, he was the opposite of the original Sephiroth, then translating it as “Bizarro Sephiroth” would have actually made sense, and would have been a valid use of an American cultural reference (because us on Bizarro World do opposite of all Earthly things!) But, because the translators misjudged the intended interpretation of 「リバース」, they ended up with a name in English that doesn’t make sense or connect to what’s actually going on in the plot. So, as a general rule, monster names in the FF6 translation were handled much more casually, leading to a set of names that are rarely accurate, but often memorable, since there were a lot of chances for Ted Woolsey’s personality and sense of humor to show through (indeed, given the time limitations that translation was made under and the fact that monster names are generally not of central importance to the plot, there probably was never any realistic choice but to treat them that way.) The FF7 translation was much more scrupulous about trying to get an accurate translation of all the original monster names, but it still made a lot of embarrassing mistakes, and it didn’t seem to have a plan for what to do if the meaning of the original name couldn’t be found, other than to use a romanization of the original name. If the translators can’t definitively answer what a name was supposed to mean, I actually have to think that making something up is the lesser evil here, since it’s at least possible to get a name that’s memorable or tells you something about the world the game takes place in that way. 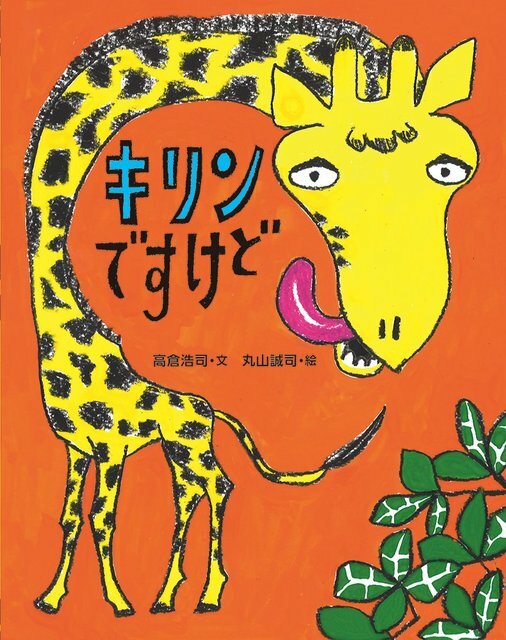 I’m not anywhere even close to being fluent in Japanese, and I have no idea whether a name like “Kyuvilduns” ever meant anything, or was some sort of cultural reference. But if there was a meaning there that a native Japanese speaker would have understood, it would have been lost in translation, since to a native English speaker, “Kyuvilduns” is just gibberish. And there are a lot of times when I think it’s best to base a translation on the logic behind how a name was selected than to try to translate it directly. 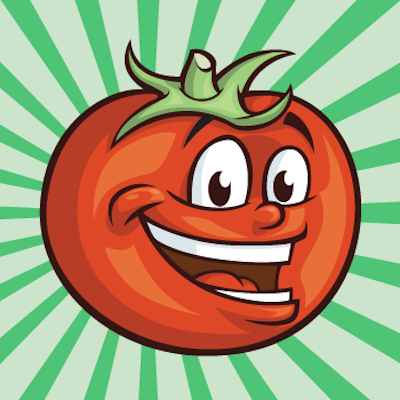 One of the most common assertions that used to be made in internet arguments about how the translations of Final Fantasy games are the worst atrocity in all of history and Nintendo of America is literally the devil was that the correct translation of 「サボテンダー」 (Cactuar) should be “Sabotender” or “Sabotenda” because it’s closer to the original kana. But if you consider the reasoning behind the original kana, it’s the Japanese word for “cactus” (サボテン) with a bit added to the end that doesn’t really mean anything in the sense of being a distinct word, but which makes it sound more like a silly monster name (it’s kind of the Japanese equivalent of creating a supervillain whose power is control over lava and calling him “Moltar”.) For that reason “Cactuar”, which is basically “cactus” modified to sound like a silly monster name, is a much more appropriate English name for that creature than something like “Sabotender”, which is meaningless to anyone who doesn’t know Japanese. As an aside, when it comes to not knowing the context for things, Zozo seems perfectly designed to give translators nightmares. There’s this one area of the game where everything that anyone tells you is intentionally false, and bits of dialogue from there could be freely scattered throughout the rest of the script that you’re relying on to understand the plot and the world that the game takes place in…. It’s not a Final Fantasy thing, it’s a RPG thing in general. When your game needs to be filled with a whole bunch of named creatures and weapons, grabbing names from mythology or history is a much better and more interesting approach than just making up a bunch of names yourself (or steal from Dungeons & Dragons, which is another common approach). The problem, of course, is that when the game is in Japanese, it’s not always going to be all that easy for foreign translators to figure out what the specific jumble of katakana you called an enemy is supposed to mean, and Japanese dictionaries generally aren’t that heavy on obscure historical weaponry and mythological beasts, so back in the days before Google, it was a pain to deal with. Yeah, it happens with Castlevania games too, especially the later ones. I’m still impressed my mom was able to pull “erinys” out of my stumbling reading of the katakana to her way back when. Not everyone can have someone with deep knowledge of classical mythology on hand, though! That’s why this isn’t really an obstacle for translators anymore. Good god, that forum thread almost gave a headache. With everyone arguing over the correct way of translating stuff and the dozens of ways some names can be translated as, it’s really no surprise fantranslations are often of poor quality. …but it’s not like people working on official translations have an easier job with this stuff? Unless they outright have access to the people that named these creatures so they can ask exactly where the name is pulled from and what it means, they’ll be debating what the right way to handle them should be in exactly the same way. For what it’s worth, FFWiki took the テンダー of サボテンダー as a portmanteau with “pretender” (which makes sense, since it’s simply pretending to be a cactus). Oh good, not only am I not the only one who remembers, but other people believe it to be a reference. About the counters: Your Japanese level is way, way (way!) higher than mine, but if I remember my lessons correctly, some items can have multiple counters, and it may not always be clear to Japanese themselves which one is the most correct (since there can be overlap). If I actually remember correctly and not misremembered them like I usually do, 台 is one of the more general counters (used for a wide variety of things) , so 隻 may be correct as well, but just a bit more specialized? Then again, I might be completely wrong as well, I certainly am not good enough to do any translation whatsoever. Although some of the mistakes in the fan translation baffle me, in general their level is much higher than mine as well. I should have said “Rydia’s lightning summon was originally translated / localized as Indra”. Sorry for the confusion. Anyone else think it’s weird that there are apparently no other airships in existence aside from the Blackjack (and Falcon)? Like, we only ever see one train in the game, but at least there’s a line that suggest that other trains exist. But apparently even the powerful military empire never stopped to think “hey, maybe we should in vest in airships too”? I might be overthinking it. yeah no, I also always thought it was weird, too, lol. The empire clearly has flying machines of various sorts (you fight their airforce!) They just don’t have airships. My interpretation is that airships are actually an obsolete, primitive flying technology that the empire has phased out in favor of its magitech-powered air force. Other people who need flying machines work with the empire; Setzer maintained his old obsolete airship out of sentimentality and a desire to remain free and independent. I dunno, if airships were obsolete we’d still probably see a lot more of them since they still make certain types of travel convenient. it still makes no sense for the Empire to have no airships if they have an air force in any case. also air superiority is a thing; even if they’re not fighting other air forces being the only ones able to attack from the air is extremely useful. in FF14 the Garlean Empire (which is basically a big ol’ reference to the Gestahlian Empire in FF6) are the only ones with military airships and unsurprisingly have been able to conquer a good chunk of the known world by having the only real air force. Some dude got so much into martial arts that he became a monster?